Recent news reports about BPA have left many people wondering what is BPA and why is it dangerous. Considerable media attention has recently focused on plastic bottles and a substance called bisphenol-A, or BPA. Many major retailers across the country began pulling baby bottles off their shelves that contained BPA. BPA is an industrial chemical used in the manufacturing of epoxy resins, polycarbonate plastics, and other products that may pose a threat to humans, especially infants and young children. BPA is primarily found in polycarbonate plastics, such as those used in the manufacturing of compact discs, water bottles, infant bottles, some food and beverage packaging, impact-resistant safety equipment, and certain medical instruments and devices. Epoxy resins, food storage containers, plastic tableware, dental sealants, and composites are other sources of BPA that pose a risk to humans. The National Institute of Environmental Health Sciences states that BPA is also present in water, dust, and air, but these sources pose minimal threat to humans. Most BPA exposure occurs through the diet. 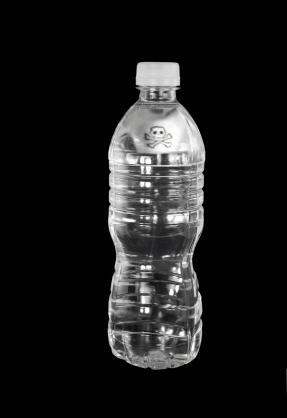 BPA may leach into foods or liquids from containers, where humans ingest it in small quantities. This leaching is a gradual process that takes place over long periods, although heating packaging that contains BPA may accelerate the process. Once ingested, BPA has estrogenic actions on the body. It can disrupt hormone levels and interfere with development, especially when ingested by young children. Repeated exposure to BPA may also increase the risk of diabetes, breast cancer, early puberty, certain neurological defects, reduced sperm count, Down's Syndrome, and prostate cancer. Moreover, new research by the University of Cincinnati shows BPA may cause heart damage, especially in women. A 2004 survey by the Centers for Disease Control and Prevention (CDC) discovered measurable levels of bisphenol A in 93 percent of more than 2500 urine samples collected from children and adults six years of age and older. The CDC considers this data indicative of the level of exposure to BPA throughout the United States. The U.S. Food and Drug Administration states that while more research is necessary into the health effects of BPA, current levels of exposure do not pose an immediate health risk to consumers. In addition to concerns about the effect of BPA on human development, experts are worried about the damage high levels of BPA are inflicting on fish and other organisms. BPA is able to enter the environment through wastewater and landfill leaching, where it breaks down slowly. Because of this, BPA is building up in water supplies and threatening fish and wildlife. The Bisphenol-A Website offers information on what is BPA and its uses in manufacturing. The University of Cincinnati website provides detailed study results and information on BPA and heart disease. Environment California is an excellent source of information on BPA and its effects on human health.